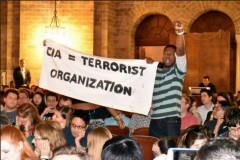 UPenn students shut down ex-CIA Director Brennan | Fight Back! Philadelphia, PA - CIA Director John Brennan came to the University of Pennsylvania, April 1, for a talk on “modern foreign policy issues, national security, and the future of the global fight against terrorism.” Firmly drawing the line against Brennan’s warmongering, a group of Philadelphia activists and organizers, led by the UPenn chapter of Students for Democratic Society (SDS), decided to disrupt his speech. inside the program. Students chanted anti-war slogans like “Drones kill kids,” and “No justice, no peace, U.S. out of the Middle East,” interrupting Brennan every ten minutes. Each time protesters rose and disrupted, Secret Service agents rushed over to forcibly remove the students. Ex-CIA Director Brennan exited the stage after being disrupted for the third time, expecting more disruptions to come. As an organization that stands firmly against U.S. wars and occupations, UPenn SDS decided to confront Brennan and challenge the University of Pennsylvania for offering a platform to justify war crimes and perpetuate the narrative that the CIA is a benevolent force in the world.